USPS posted a net income of $307 million in the first quarter of fiscal 2016, the first such gain since the fourth quarter of fiscal 2011. Profits grew $1.1 billion over the same period last year, when the Postal Service lost $754 million. Operating revenue ticked up 3.3 percent to $19.3 billion between Oct. 1 and Dec. 31, 2015, driven largely by a record volume of package delivery. Shipping and package revenue increased by 13.5 percent in the quarter, which included the holiday period. The first quarter is typically the best of the year for the Postal Service. The positive financial news did not prevent Obama from calling for the Postal Service to continue shedding jobs in his fiscal 2017 budget, along with a comprehensive overhaul of the agency’s operations. The projected 12,000 USPS job loss in 2017 falls in line with projections released by the Postal Service itself in 2012 as part of its five-year plan. Excluding the Postal Service, Obama’s budget would add more than 30,000 civilian federal workers in fiscal 2017. The mailing agency -- which has shed 250,000 jobs over the last 20 years -- also renewed its call for fundamental legislative changes to firm up its financial footing. 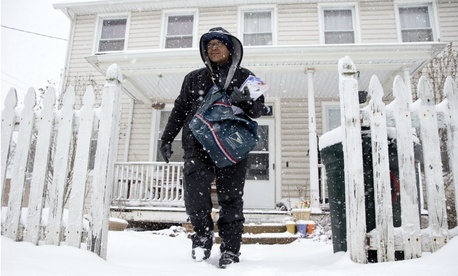 USPS noted it would have lost $700 million if not for a temporary price increase set to expire in April. As part of his budget, Obama -- as he did last year -- proposed Congress make the recession-induced surcharge permanent. Obama repeated many of the proposals included in his previous budgets, such as suggesting the Postal Service cut Saturday mail delivery after volume declines to a level the White House expects USPS to hit in late 2018. While the Postal Service has long lobbied for the modified delivery schedule, it has dropped that proposal from its “must-have” list in legislation. Unlike his legislation in the 113th Congress, a bill authored by Sen. Tom Carper, D-Del., also dropped the five-day language. The president’s plan would allow USPS to phase out to-the-door delivery in favor of centralized or curbside delivery, while codifying the current policy of not closing rural post offices. The White House again pitched increasing revenue by providing postal management with more flexibility in creating new business opportunities, as well as boosting cooperation with state and local governments to offer services at post offices. Postmaster General Megan Brennan on Tuesday echoed the call for congressional action, saying the agency’s positive numbers should not mitigate the need for reform. “Despite these achievements and the best efforts of our employees, our financial condition will worsen without legislative reform,” Brennan said.